May 2000 was a busy month for me. I spent the entire month traveling in Europe and Asia. During the first part of May I was in Germany to exhibit Aqua Craft®, Inc. items at InterZoo. InterZoo is the worlds largest pet product trade show. It is held every two years in Nuremberg. Nuremberg, Germany is a charming small city with cobble stone streets, centuries old buildings, great food, nice people and mostly Mercedes Benz taxi’s. This year the trade show had a record number of exhibitors. However, customer attendance (industry dealers) was down. Fewer store owners thought the show was worth attending than in 1998. The 1998 show was a slower than the 1996 show. Although many manufacturers (exhibitors) had new items to promote, they were reluctant to display them. The reason for hiding new items from open view and showing them only to established customers was simple. There was an abundance of Mainland Chinese “guests” that represented manufacturing factories in China. Exhibitors feared there new items would be copied and sold to second rate dealers world wide, just as their legitimate advertising efforts got underway. This is the same situation that developed in the US around 1991. Poorly designed aquarium filters, bio balls and lighting systems were copied and recopied. A surprising number of new marine salt brands also surfaced at this time. This resulted in low quality items that confuse and plague the industry with sub standard products that do not meet basic consumer requirements. This practice continues today. Oh well. If you are in the pet industry, that is the real world. Sift through the chaff. Locate a decent dealer that offers useful information, sells healthy live stock and quality products. Avoid copy, counterfeit and second or third rate products. Rise to the real challenge of aquarium keeping. E.g. locate a decent store and support their efforts. It took 12 hours to fly back to the US. I stayed for about 40 hours. I then started a 18 hour air trip to SE Asia. I was offered a 7 day package at a 5 * resort on Bintan Island in Indonesia. The resort was new. It is set up to accommodate about 3500 guests. There were about 125 guests total for the week I was there. It was like having the entire island to myself. I had two things on my mind. 1) The show in Germany was an indicator of how the pet industry is going internationally. It seems to be getting lower and lower. Manufacturers continue to produce down to the masses. Counterfeit items. Low margins. The computer industry taking hobby dollars out of the pet industry …. I am fortunate to have been in this business for 30 years. I have a healthy, stable customer base. 2) Jet lag was taking its toll. My agenda for the next week was simple. Long walks on the beach two to three hours before an after the equatorial sun peaked at noon. Avoid sun burn. Get a golden tan. Meet locals and enjoy the cuisine. Walks on Indonesia’s sun drenched beaches afforded me the opportunity to relax and get in touch with feelings that should not be denied any human. Each day I walked the beach I observed gentle ocean waves rhythmically filling tide pools that teamed with colorful marine fish and invertebrates. Amphiprion clarkii photographed at a depth of 2′ with a Nikonos. 24 mm lens. F: 8. ISO 100 Kodacolor film. Natural light. In natures aquarium (the ocean) each and every marine fish and invertebrate is supported by billions upon billions of gallons of naturally replenished and highly oxygenated ocean water. This is a far cry from over crowded, under filtered marine aquariums. Most marine aquarium keepers try hard to maintain a healthy tank. But, they get caught up in the advertising hype and stumble thorough the “opinions” of others that are usually still stumbling. — I highly recommend diving a reef or at least walking a tropical beach for marine fish and reef keepers. If you can adjust to life without: using the freeway as a parking lot, unhealthy fast foods, screaming kids at the mall, no cable, let alone pay per view, then, This is the REAL WORLD. My next stop was three days in Singapore. It is an area of about 25 square miles. Singapore is a “fine” city. Chew gum, jay walk, smoke, spit or don’t flush a public toilet… pay a fine. The upside to this very modern, hot and humid city is their great food. Locals speak a charming blend of UK English and Mandarin Chinese. This colorful language is refereed to as Singlish. 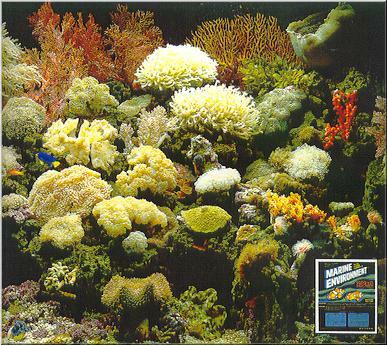 Magnificent 125 gallon / 500 L reef tank heavily stocked with colorful corals utilizes trickle filter and Dupla lighting. Photo taken with Nikon F. 28 mm Auto nikkor lens set at f: 5.6. Kodacolor ISO 100. Electronic flash, X synch. 1/60. I visited several tropical fish stores. One outlet had some of the best live corals tanks I have ever seen. It is obvious that a great reef tank requires three basic things. a) Water quality. The proper marine salt must be used. b) Filtration. Water must be biologically filtered and returned to the aquarium highly oxygenated. c) Lighting. Lighting systems must utilize 5600°K to 10,000°K lamps in properly designed reflectors. It took a short time to visit stores. The rest of my time was spent sampling local foods and sight seeing. When you are in Singapore check out Newtons Circle, Raffels Hotel, Sintosa Island and sample the buffet at the Mandarin Oriental Hotel. If you can eat most of your conscious hours, rush around in a hot humid environment, asking everyone to repeat themselves constantly, while doing this in a “fine” country, then this is the REAL WORLD. My next stop was six days in exciting Hong Kong. I visit HK every two to three months. Aqua Craft’ , Inc. items are strong in all SE Asia. It took two days to visit our aquarium accounts. Currently, everything is going well. A large international selection of marine fish can be found in Hong Kong. Fantastic 90 gallon / 360 L mixed marine fish and reef aquarium is lit with metal halides and utilizes a trickle filter equipped with Super BI OX®. Photo: Nikon F. 28 mm Auto nikkor lens set at f:5.6. ISO 100 Kodacolor film. Electronic flash, X synch, 1/60. On my third day I was treated to a superb lunch at the private Macau Jockey Club. The lunch featured a gourmet selection of fine foods. The meal was enhanced with the offering of fine wines and premium Cuban cigars. Later that day I was asked by one of my hosts how I liked the Macau Jockey Club. I replied, “The Macau Jockey Club is very nice, if you cannot get into the Hong Kong Jockey Club”. The following day I was invited to the ultra private HK Jockey Club for an extravagant lunch. The menu featured an immeasurable world class selection of Epicurean delights, vintage wines, premium cognac’s and a comprehensive selection of well aged and bigger Cuban cigars. The fifth day started out with a invitation to breakfast at the sheik private China Club. At 08:30 I was sampling world famous Hong Kong noodles, dim sum and more Havana cigars. If you can exist in a highly competitive living environment associated with a demanding work schedule, and you can afford to live in one of the worlds highest cost per kappa locations, then Hong Kong is the REAL WORLD. My next stop was six days in Taiwan. Taiwan is an island about 90 miles off of the east coast of Mainland China. It is about 290 miles north to south and about 85 miles from east to west. The capitol city is Taipei. I also visit Taiwan every two to three months. The Taiwan economy is recovering from ills in the mid 1990’s. We are supplying a major segment of top end aquarium stores in Taiwan with our items. 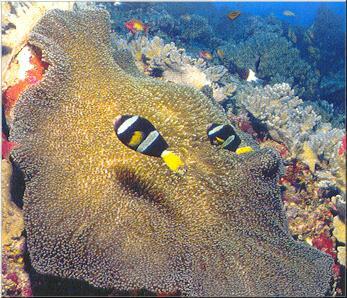 The seas around Taiwan offer unique marine fauna. After spending two days visiting our accounts, I spent the rest of my time at the American Legion, AmVets and VFW clubs. There is nothing like a healthy clean USDA steak with apple pie with ice cream. This in a location that is world famous for serving street foods that offer nothing less than a rush trip to the nearest water closet or an uncomfortable taxi ride to a hospital. If you can deal with 24 hour snake like traffic, avoiding motor scooters speeding on side walks, foods that can rip you apart, then this is the REAL WORLD. I am back at my desk at the Aqua Craft®, Inc. World Head Quarters office in the USA. I long for the walks on the tropical beach in Indonesia, the great foods of Singapore and Hong Kong. I even miss the hectic pace of Taiwan. But, this is the REAL WORLD.